It is very encouraging when the lagging groups such as financials and semiconductors are turning into market leaders. It is demonstrating the health of the underlining market that it is willing to discount the present fundamental problems. Next week we will face the earnings report of the heavy weights such as Apple, Amazon and Microsoft. The Fed is also making public statements on Wednesday so we can expect volatility to pick up next week. Because of the important pending earnings reports and Fed statements, the market was indecisive on Friday. The DOW gapped up at open to take out the high of 01/18/2019, it continued to trade up a little more, then it started to fade around 10:50 a.m. The S&P 500 and Nasdaq both failed to exceed the previous high that occurred on 01/18/2019. The three indices again acted with inconsistencies. We had short positions since 01/18/2019, shorting again the high of 01/18/2019. Because of the very mild correction, we got out of the short positions on Wednesday and Thursday. On the daily cycle count, it is on the 20th day on Friday. It could have been the first day of a new daily cycle if it was able to take out the downtrend line and close at or near the high of the day. But it didn’t do both things, so the market is still considered as topping at the moment. Because we are in the topping phase, the next possible direction is down. So from the cycle technical analysis point of view, we are expecting the market to sell off somewhat to work off the current overbought condition next week. On the weekly cycle count, it is entering the 5th bar. It is in a bullish low-high phase, so the current daily cycle high-low correction can be bought. 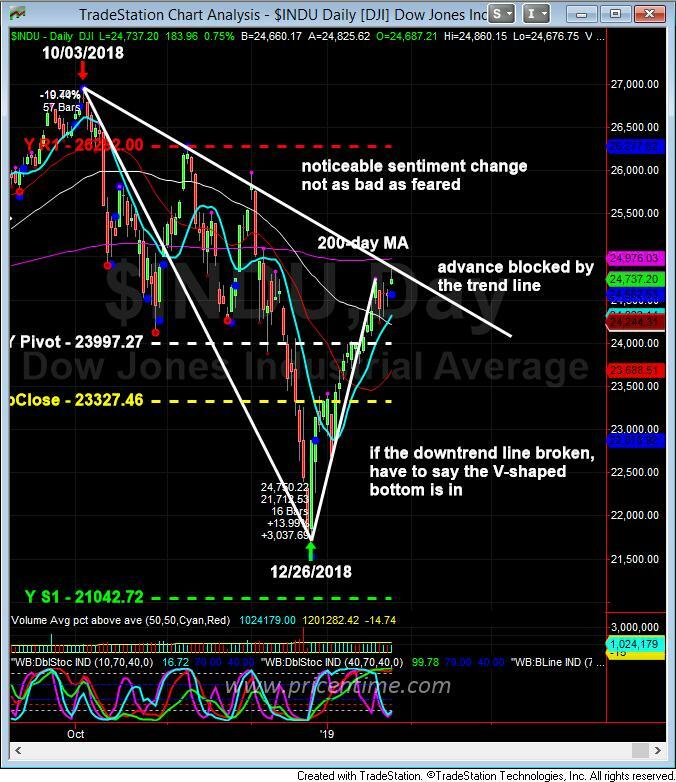 When the DOW makes 38% retracement of the previous advance (21712.53-24860.15) to reach 23657 level, it should be bought as the bullish cycle will last until mid to late February. 23.6% retracement of the previous advance (21712.53-24860.15) is 24117. It could also just hit this level then take off. We are going to watch carefully next week to see how the market reacts to the earnings reports. This entry was posted	on Sunday, January 27th, 2019 at 7:20 pm	and is filed under Forecasts, Stock Indices. You can follow any responses to this entry through the RSS 2.0 feed. Both comments and pings are currently closed.